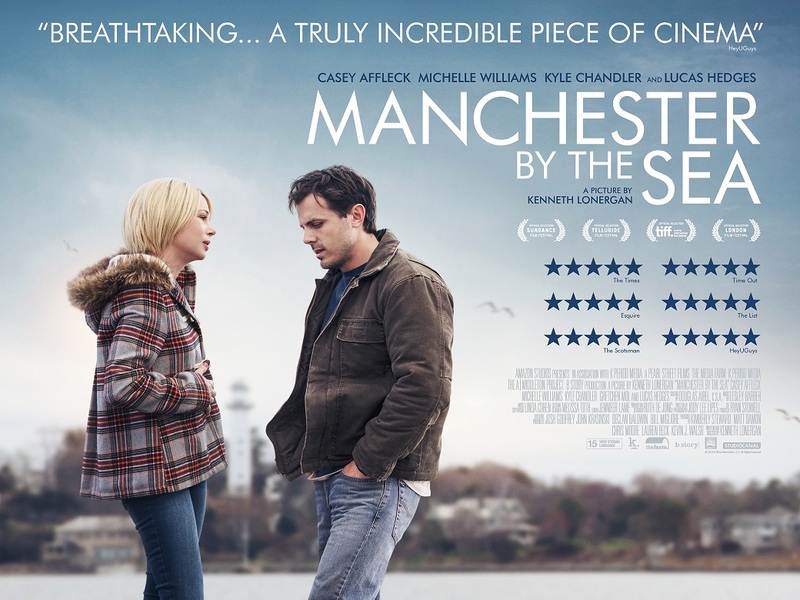 “Manchester by the Sea” is a movie that broke my heart, cracked me up, and had me thinking about the emotional pains we experience that never truly go away. The kind that we either don’t know how to cope with or move on somehow, for better or worse. For a movie to do that and do it in an effectively poignant manner is impressive and quite memorable. There are moments in this absorbing melodrama, which is written and directed by Kenneth Lonergan, that I continue to replay in my mind and potent emotions that I’m left to ponder over and over. His latest film finds the filmmaker returning to the potent character examinations found in 2000’s “You Can Count on Me” and 2011’s “Margaret”, offering a patient and intuitive look at grief and responsibility with superb storytelling that handles heavy subjects with heart, humor and empathy. Lonergan’s story follows Lee Chandler (Casey Affleck), a misanthropic janitor/handyman to select Boston apartments who has developed a reputation for being unfriendly and rude, a solitary figure who can be found in a local bar, seeking an outlet from his self-loathing and pain. He gets a phone call one day stating that his older brother, Joe (Kyle Chandler) is in the hospital and by the time he drives up to the coastal town of Manchester to see him, he has died. He stays in the town, a place he once had a family with his ex-wife, Randi (Michelle Williams), in order to get his brother’s affairs in order and organize a funeral, as well as look after Joe’s teenage son, Patrick (Lucas Hedges), now an orphan, due to his estranged relationship with his mother (Gretchen Mol), a drug addict long out of the picture. Frequenting old haunts brings back memories of his own personal trauma and now the need to care for Patrick, brings an added change to his otherwise structured life he has created which has closed himself off from others. As Lee and Patrick develop an unconventional bond, Lee continues to struggle with his past, present and uncertain future, all of which he’d rather ignore. 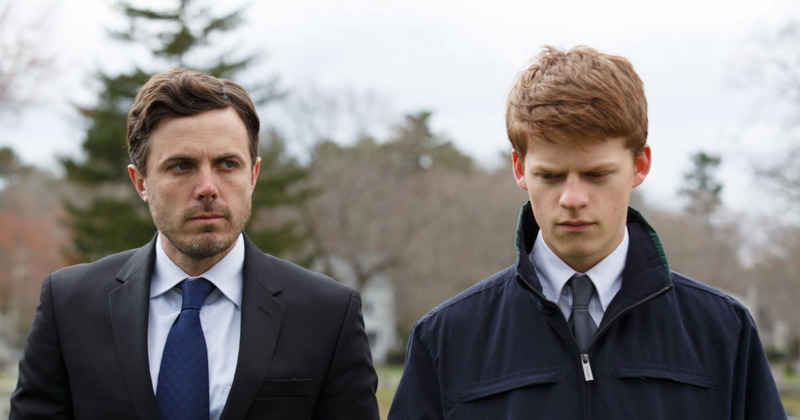 “Manchester by the Sea” is filled with flashbacks to Lee’s past that inform viewers of the many good and bad memories from his past. There are no distinctive aesthetic transitions to these flashbacks, Lonergan inserts them in much the same way that our own memories surface, either unexpectedly or when we think of as certain person or place from our past. It may be hard to tell which scenes are present and what’s taking place in the past, but that becomes clearer the more we learn about Lee in the present. It’s an approach confirming that Lonergan trusts his audience to learn more about the lives of the characters he’s presenting without exposition or providing an avatar character that would serve as our gateway to the world he’s created in his film. There are memories picturing familial contentment, like the ones where Lee is on his brother’s fishing boat with Joe and a young Patrick as well as images of Lee’s past family life with Randi, but the closer he gets to Manchester and the more time he spends there, the more challenging the memories get. We also see flashbacks of Lee’s time with his brother, including the diagnosis of heart disease that would eventually claim him, confirming the closeness Lee felt toward Joe. There is also the heartbreaking replay of a particular tragedy that left Lee emotionally numb and filled with guilt and regret. These memories are portrayed in much the same way they occur in our own lives, they come and go without warning, sometimes like a wave of emotions that we’re not prepared to deal with and other times what we remember are snippets of a whole that our subconscious has tried to ignore in an act of self=preservation. Lee is a fascinating and somewhat difficult character for audiences to get to know and both Lonergan and Affleck slowly reveal why that is. At first, his withdrawn despondence is easy to relate to as we see how the minutiae of his daily job duties can feel like both an escape and yet another annoyance in life, especially as we see him deal with some demanding tenants. But there’s also this seething rage under the surface, which we see a bit of as he matches vitriol with a tenant (reacting the way we’d all like to toward those disgruntled/entitled clients/customers many of us are familiar with, although Lee should know better if he wants to stay employed) and channeled in local bars when we see him pick fights with strangers who he feels stare at him or randomly bump into him. It might seem like there is nothing to like about this character, but the more time I spent with him, the more I realize this wounded character is not unlike myself and people I know – aware of their own reclusive and self-destructive behavior, yet ambivalent toward it or a prisoner to it. It also might seem like Affleck is simply playing another Boston area character, with the accent and blue-collar attitude, but this is actually his a well-calibrated performance from Affleck, playing probably his most raw and real character that I can recall. He’s already won some awards for this role and I wouldn’t be surprised by him taking home a Golden Globe and an Oscar. As his brother Joe, the always reliable Chandler is great at playing the stalwart guy that not only Lee loves and looks up to, but someone who seemingly everyone in town has something nice to say about. In the short amount of time Williams is on-screen, she provides the other half of Lee’s broken heart, conveying the typical open-hearted performance we’ve come to expect from the actress and in one particular chance meeting on the street with Lee, she solidifies why she’s already been receiving awards for her role as Randi. It’s flat-out heartbreaking and one of the best moments I’ve seen all year and a reminder that this film is also about forgiveness and the inability to forgive ourselves. 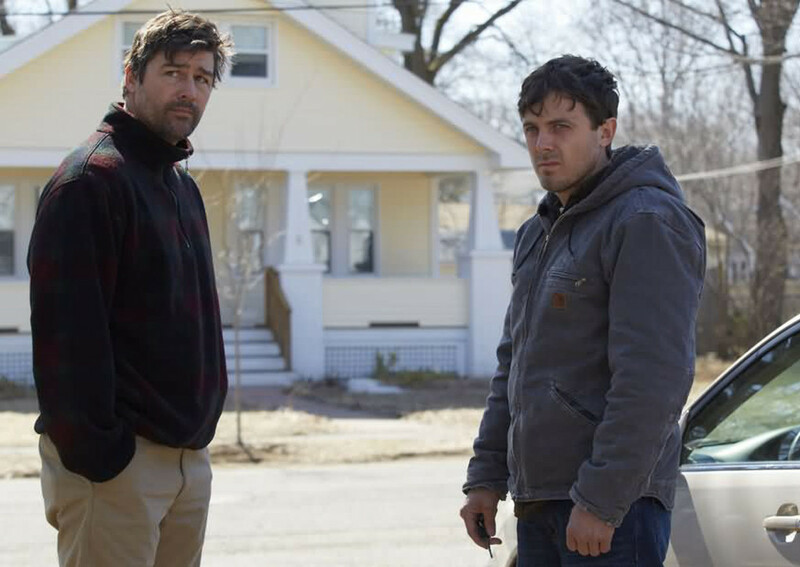 As much as most of “Manchester by the Sea” touches on grief and devastating loss, there is some dead-on dry comedy as well and that mainly comes from interaction between Lee and Patrick, which is the core relationship of the film. Although Lee loves Patrick, he’s been absent from the teen’s life and there’s an understated resentment the nephew has toward his uncle, who surprisingly (to both of them) has now has custody of the young man. It’s a responsibility Lee doesn’t want, but out of loyalty to Joe, he tries it out – chauffeuring around Patrick from hockey practice and playing in a rock band as well as navigating between two different girlfriends (played by Anna Baryshnikov and Hedges’ “Moonrise Kingdom” costar Kara Hayward) – and there is humor found in Lee’s observance of Patrick’s social life and attitude. Hedges is great with Affleck, acting like a typical self-absorbed teen who’s primarily concerned with how the trips to the funeral home and lawyer’s office impact his own schedule. The young actor excels at balancing a distance toward and need for Lee in his life during this confusing time and their comical albeit awkward relationship is naturally written by Lonergan, who provides his actors with some authentic and hilarious dialogue. As much as Patrick relies Lee, he always winds up drawing his uncle out of his guarded self, something that is inevitable and needed. The town of Manchester, as photographed by cinematographer Jody Lee Lipes, is as much a character for Lonergan as the distinctive characters who reside in it. What transpires primarily takes place in a cold wintry landscape where the ground is too frozen to bury a dead body. Lonergan captures the stubbornness and closeness to the community of Manchester as well as placid scenes of harbors and early sunsets which envelop the town into cold darkness. Throughout the film, the elegiac orchestral and choral music from composer Leslie Barber (who also scored “You Can Count on Me”) that may feel like a dirge at times and require some getting used to for some, but it also seems to accentuate needed contemplation and reflection. Explaining what “Manchester by the Sea” is about to others doesn’t really do it justice. It’s the kind of story about people that viewers don’t think they need until they see it. Granted much of the hurt and pain in the film will be off-putting for some, as will the behavior of some of the characters, but to me those are elements of real life that Lonergan successfully presents in an honest and sincere manner, trusting both his actors and audience to understand the complexities and unexpected humor that life brings. I’m surprised that although I’ve seen the film twice now, I find myself wanting to come back to it “Manchester by the Sea”, to study Lonergan’s storytelling and appreciate these great performances even more. 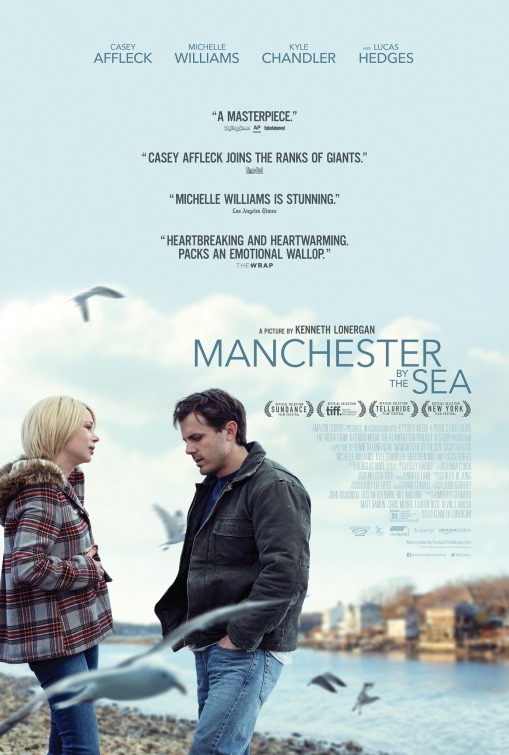 “Manchester by the Sea” has earned five Golden Globe nominations and is already an award-winner with the National Board of Review and the Critics’ Choice Awards, as well as the four recent wins from the Chicago Film Critics Association. This affective film will certainly have a strong presence come Oscar time.